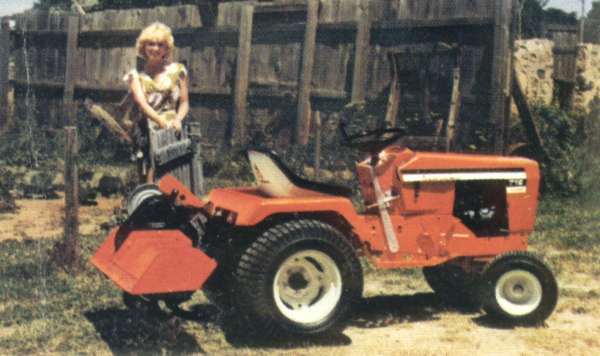 Power your way through the meanest drifts and the wettest snow with Allis-Chalmers 36" or 42" snow throwers! Sturdy auger takes a yard-or-better bite, throws snow well over banks and build-ups. Adjustable skid shoes enable you to clear even graveled areas quickly, cleanly. 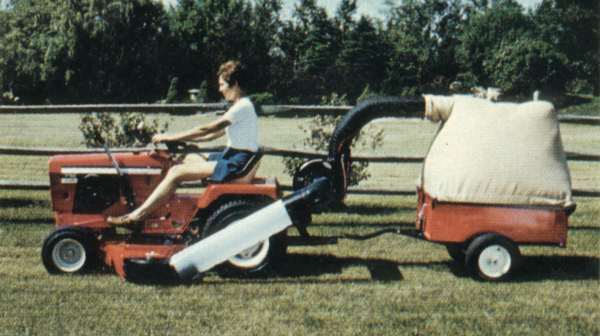 Dump cart and cart cover and adapter make a vacuum collector out of your mower -- and make leaf and trash pick-up a breeze. Optional roving nozzle cleans under shrubs, around plantings, along foundations and in window wells. New 38" heavy-duty tiller features slasher type tines of forged high carbon steel to tackle the toughest soil conditions. 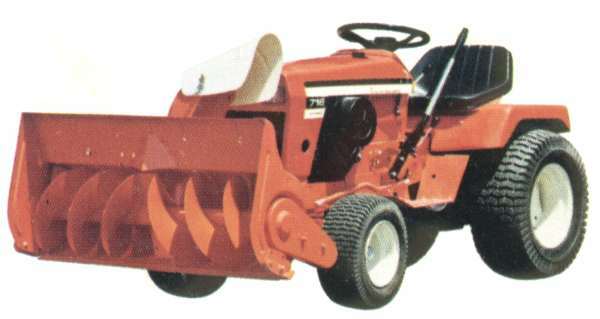 Its right-side chain and sprocket drive produces heavy-duty power transfer for straight ahead tilling without trash build-up. The overlapping tines of our 36" rotary tiller attachment work up a thoroughly mixed and crumbled seedbed...work soil between crop rows, too. 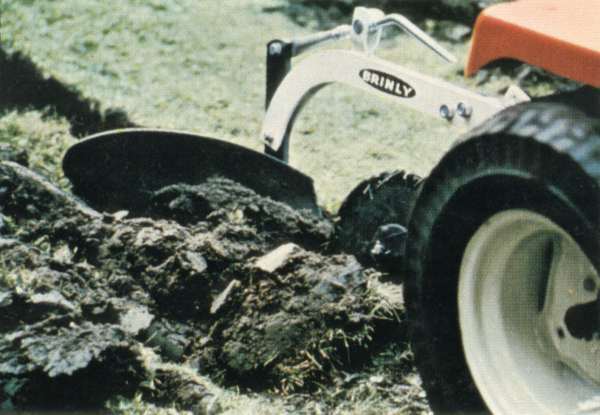 10" moldboard plow turns over soil and sod, covers weeds, crop trash, field residues, leaves lumpy surface to slow water run-off and soil erosion. 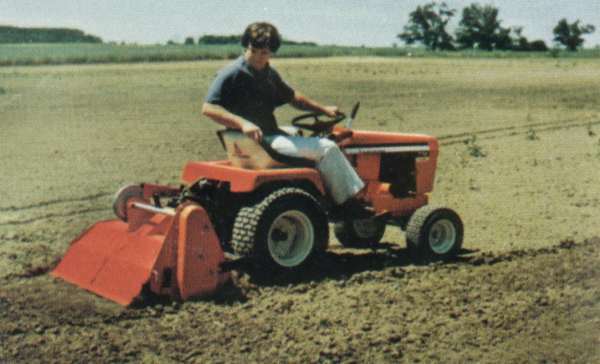 Rolling coulter slices through ground cover for clean-cut furrows. 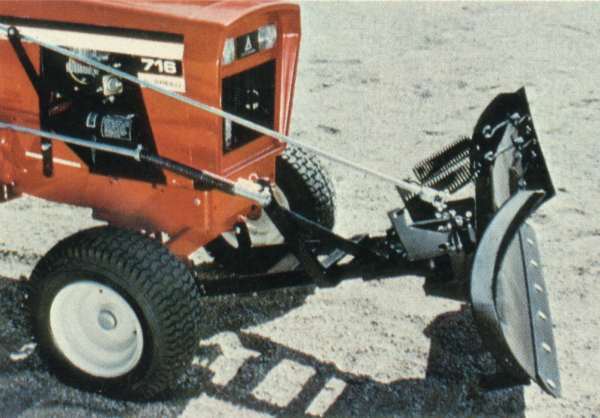 46" angle dozer blade lets you set angle from the tractor seat as you go, up to 30°. Almost 12" of vertical clearance in raised position. 42" blade also available. 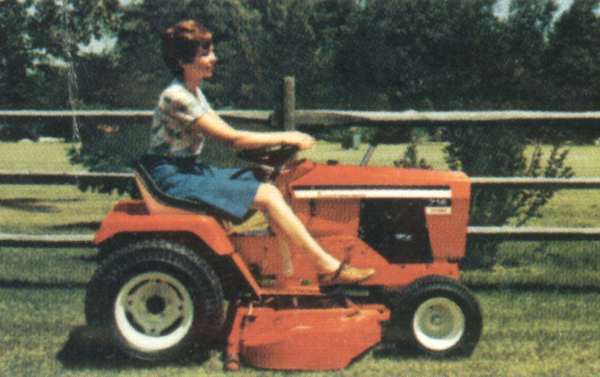 These 42" and 48" grass-tamers have three overlapping blades for a smooth even cut, with deep deck design whose extra large air volume helps assure broader discharge of clippings and mulch. Engineered for non-scalp mowing that follows ground contours -- with any desired height setting from 1-5/8" to 3-1/8".